Leather Dye or Leather Paint? CouchGuard® Leather Paint has the sealer built into the formula making this a one step application for the D.I.Y’er. Its flexible, durable, comes in a range of colours and won’t rub off onto your clothes..
Our formula has the sealer built in. Waterborne Technology and includes the pigment, binder, reducer and topcoat! No need for additional smelly solvent sealers which is extra work and costly. 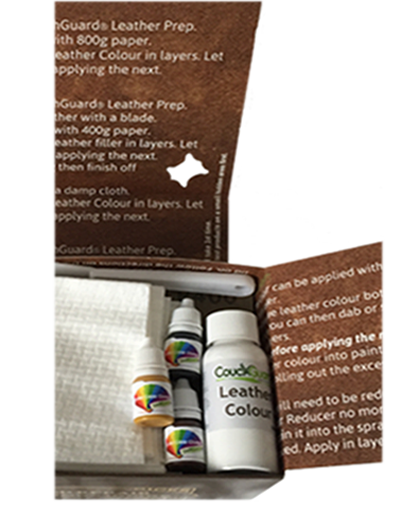 Designed especially for Finished / Pigmented Leathers, CouchGuard® Leather Colours are durable, flexible and won't rub off onto your clothes. 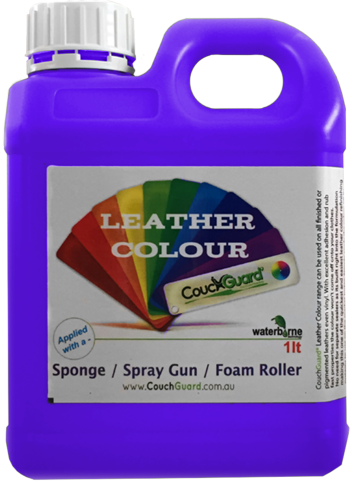 CouchGuard® Leather Colours are easily applied with a sponge, foam roller or spray gun once the area has been prepared. CouchGuard® have over 65 stock colours but you can make your own by mixing these together or we can mix n match any colour if you have a suitable sample. Conditions and additional charges apply. We use the best quality ingredients on the market and all backed by Stahl®, the industry leaders in leather finishing products. Just apply the CouchGuard® Leather Colour in layers allowing each coat to dry until the are is covered. In this modern world of technology we live in today, Pigmented Leathers are coloured using a Rotary Spray Painting Machine. The leather hides are placed onto a conveyor which slowly feeds through the machine while the leather colour is applied by multiply spray heads circling above. This is all computer controlled with minimal paint wastage as the spraying stops as the head passes of the edge of the hide. Our advanced formulation means applying our Leather Colours is very simple. You can use a sponge, foam roller of spray gun. Sure, leather is dyed during the tanning process but the final coating is pigment, which is paint and I would say approximately 95% of people get this wrong. It whats known as a Pigmented Leather or Finished Leather and it makes up for about 98% of leather goods including leather couches and automotive leathers on the market.. Here are some commonly asked questions that may just help you. I want to dye my leather couch not paint it? If you have a Finished / Pigmented Leather now then you need to use our Leather Paint and not leather dye. Leather Dye is for Aniline Leather and vegetable crusts, is solvent based and requires a sealer to be applied afterwards. What does the leather feel like after being coloured? Your leather will still look, feel and smell like leather after after being coloured. After the new colour has fully dried, apply CouchGuard® Leather Conditioner to the leather surface to keep its supple feel. 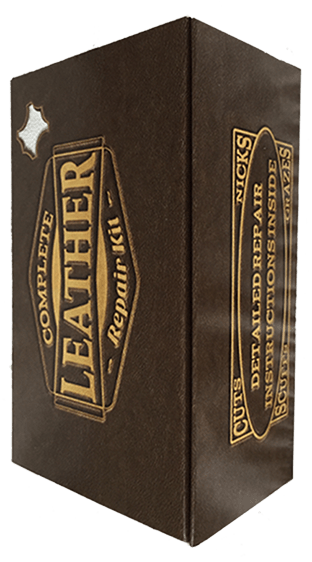 Whats the difference between Aniline Leather and Finished / Pigmented Leather? Aniline Leathers are the natural looking leathers, is the very best quality and has natural markings with a waxy feel / finish to it. That colour everyone wants to colour their leather too! Finished Leathers are still good quality leather but have the imperfections removed, filled, grain embossed the pigment aka Leather Paint applied to achieve that coloured finish. Lets face it. You don't see green or blue cows walking around the fields! Can I use the leather Paint on car seat leather? Certainly. Automotive Leather is Finished / Pigmented Leather. My leather is a beige colour now. Can I change it to charcoal? Certainly. It makes no difference to the end result what colour your leather is now. If your leather is in good condition now, then the end result will be great.